GRS participated in the conference of Solar Power North Africa – Cairo, held in Cairo the days 9 and 10 of February, in order to follow closely the evolution of the the Solar Photovoltaic market in the region of MENA. With a large presence of the main investor participants in the program FiT 2GW in Egypt, the conferences confirmed the enormous potential of the area thanks to the liberalization of the energy market and the gradual elimination of price subsidies for conventional energy on several of these countries. 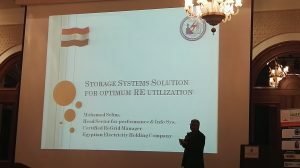 We also found that governments such as the United Arab Emirates, Egypt or Algeria seek to enhance the use of large-scale storage to stabilize their networks and get more value from huge solar resource available. The conference also served to show customers, partners and subcontractors, the firm will of GRS to position itself as one of the leading service provider in the photovoltaic sector in the area.